Travel and history so often go hand in hand. It’s one of the aspects I enjoy most about a new place, learning about the events and the people that came before I was standing there myself. I remember the many field trips I would go on around the Bay Area in California, to learn about the California Gold Rush or the lifestyles of the early Mexican immigrants. When I visited Europe, I was in awe for a whole summer to see monuments and pieces of art that I had only seen in the pictures of my history books. In Australia, I would go to spots like Cockatoo Island to learn about convict history, or Ku-ring-gai Chase National Park for the rich Aboriginal heritage. In New Zealand, I would spend all afternoon in Wellington at Te Papa to educate myself on Maori culture, and the struggles and strides they’ve made in the last 176 years since the Treaty of Waitangi. Similar to my home state of California, Oregon has a fascinating pioneer history and plenty of gold rush stories. 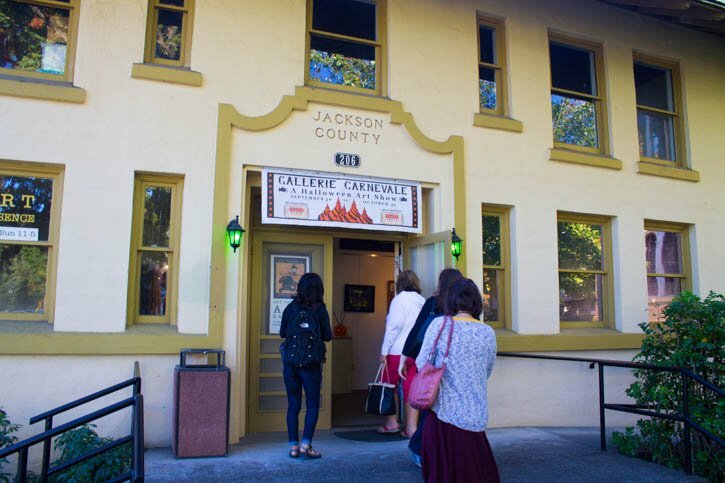 The Gold Rush in Oregon is never something I learned much about when I was growing up, so I was excited to recently spend a few days in Jacksonville to step back into that era of time in southern Oregon. When you walk down the streets in Jacksonville, it is as if you’ve been transported back to the 1850s. Most of Jacksonville itself is a National Historic Landmark, with most of the historic buildings and homes in the downtown area restored to their original elegance. 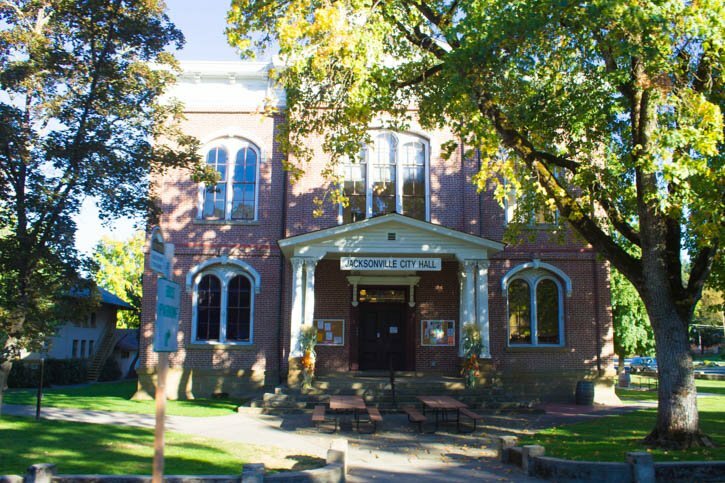 After the discovery of gold in 1851 at Rich Gulch, Jacksonville became a bustling town in southern Oregon. In fact, it quickly became the largest town in the area with hoards of people rushing in for the chance of finding gold. One of the most important historical figures that came due to the Gold Rush was Peter Britt. After the gold fever died down, he decided to stay in the area and pursue his passion of photography. His art form allowed us to have pictures to look back on today, to better understand the life of a pioneer town. That name may also be familiar to some for the popular music festival that is named after him, and takes place on his estate each year in Jacksonville – the Britt Festival. The festival is a summer long event that draws people from all over Oregon and the country to the small town of Jacksonville. There are numerous historical figures to learn about during a visit to Jacksonville, such as Cornelius C. Beekman, who struck gold and decided to start the first bank in Oregon. You can now take tours of the Cornelius Beekman House and Beekman Bank. If you want to go further into the history of Jacksonville, one of the best ways to do that is through a trolley tour. 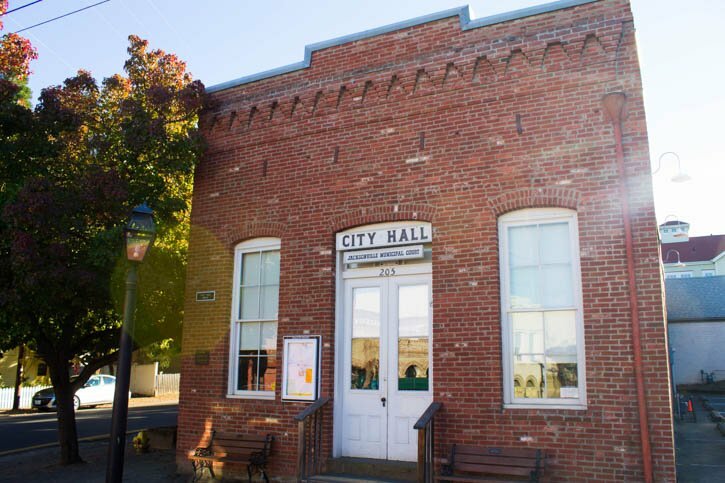 They only run during the summer season, but it’s a fun way to dive into the history of the town in style. If you happen to visit outside of summer, there’s always the option for a self-guided tour. The Jacksonville tourism board website has a free self-guided walking tour and audio guide that you can download here. And it’s no surprise that with pioneer history involved, there are a lot of ghost stories around town too. If you want to learn about the ghostly side of history in Jacksonville, there are many resources you can find online that talk about the haunted places around town. The Jacksonville Cemetery offers evening walking tours on the second Tuesday of the month from May through August. 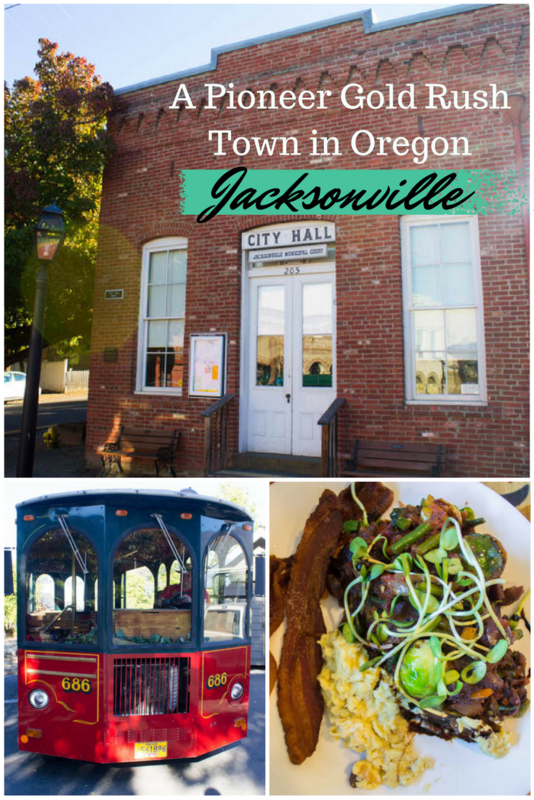 Oregon has a lot of pioneer history to discover, but I have yet to see a more interactive and alluring historical town than Jacksonville in the state. There’s a certain kind of magic in the air that makes you feel like you’re a part of that history too. As a history buff, I could not think of a better place to to spend a few days in Oregon. 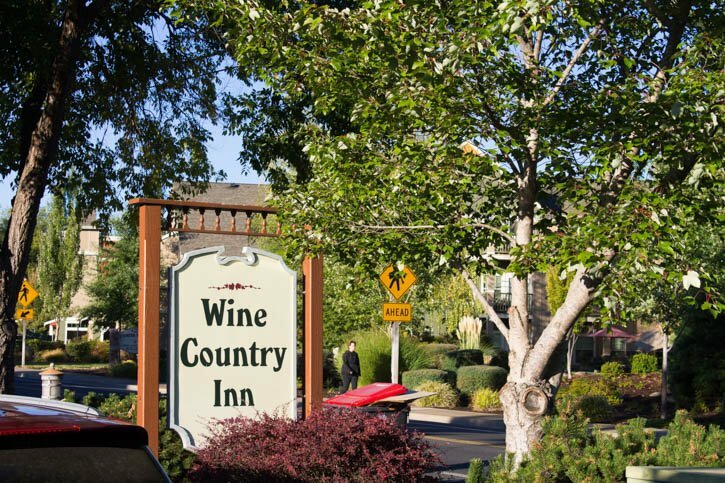 Where to stay: I stayed at the Wine Country Inn which was conveniently located in downtown. It was a comfortable, clean, and no frills establishment that was a good base for my explorations around the Applegate Valley and Jacksonville. It’s also one of the more affordable options in town. If you’re wanting to stick to the historical theme of the city, there are a few historical hotels and B&Bs to check out, including the Jacksonville Inn, McCully House Bed & Breakfast, and Bybee’s Historic Inn. Where to Eat: I had a lot of good food while I was in Jacksonville. 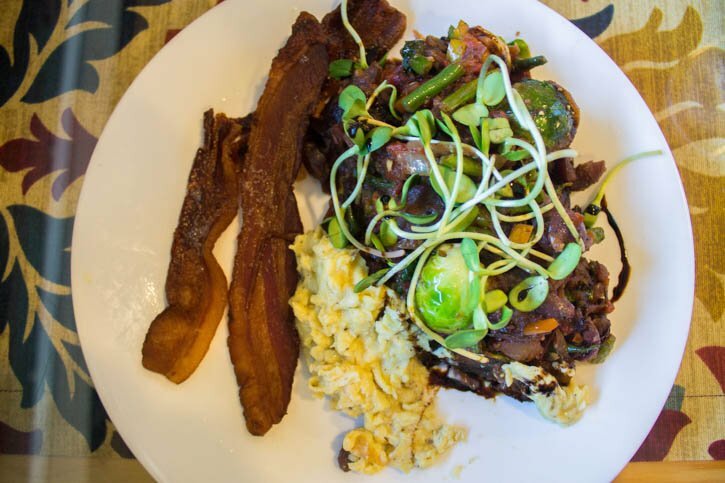 My picks for classic American Northwest cuisine with a farm-to-table focus would be the following. The Jacksonville Inn, in addition to being a great historical place to stay, is the spot for a nice dinner in town. The dinning room was build in 1861 with locally quarried sandstone and you can still see specks of gold in the mortar. C Street Bistro was perhaps my favorite culinary experience due to the uniqueness of the menu and friendly chef. This place is the epitome of farm-to-table cuisine and has many French-inspired dishes. Britt Festival – this summer music festival is held on the Britt Estate each season, featuring jazz, folk, country, pop, dance, and classical music. Wine Tasting in Southern Oregon – I already wrote a post about how impressed I was with the southern Oregon wine scene, and this is an activity not to miss if you’re visiting Jacksonville. 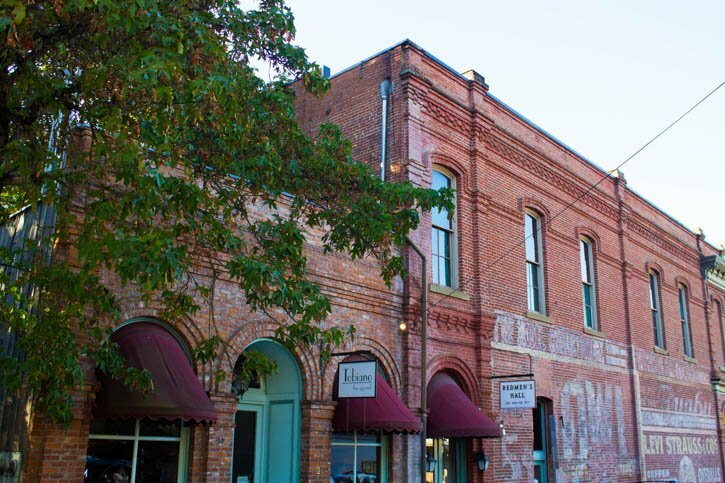 The Applegate Valley is right there for you to explore, and other popular wine valleys are only a short drive away. There’s also South Stage Cellars right in town if you want to taste a wide variety of local wines without leaving Jacksonville. Art Presence Art Center – located in the old Jacksonville jail, this art gallery displays local art in a funky and unique way. 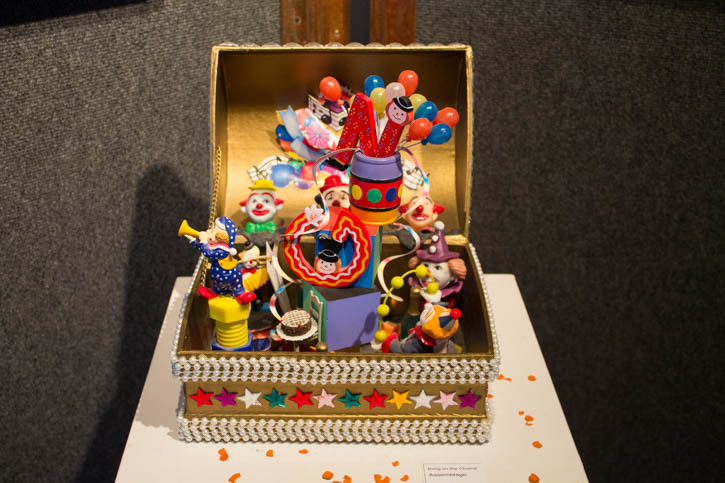 I was there during their Halloween and circus themed exhibit and I loved the interesting artwork I came across. 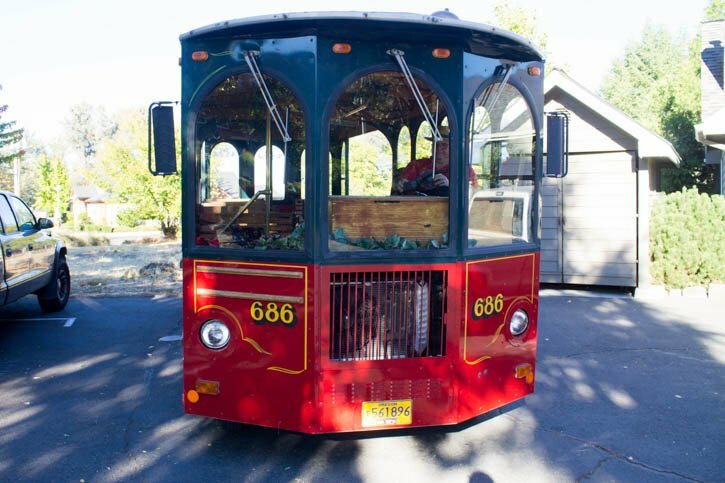 Trolley Tour – you can’t visit Jacksonville without going on at least one trolley ride. There are two trolley companies that you can take a tour with in the area – Jacksonville Historic Trolley Tours & All Aboard Trolley. The Jacksonville Trolley company is the perfect choice for a history lesson around town, whereas All Aboard is a good choice for a fun wine tasting experience. Both companies offer private tours depending on what you’re looking for. I’d love to know, do you enjoy learning about the history of the places you visit? Have you been to Jacksonville or southern Oregon before? Note: I was a guest of Travel Southern Oregon, but all opinions, as always, are my own. This looks like an awesome place to visit! I’m adding it to my bucket list! Oh good! Jacksonville is definitely worth a visit Adree. Anything old and historical I am down for. Add some great food and scenery is beautiful makes for a good day. What a fun trip in my home state! How cool! I do love a good ghost story. Also, you are well traveled, very impressive! Hahah me too! There’s something about ghost stories that stick and make you remember the history even better. Thanks for reading Nicole! Jacksonville is such a cute town! I used to work at the NBC station in Medford and we’d often venture into Jacksonville. Looks like there is so much more to do and see there now, even. We’ll have to plan a trip back! It is Marlynn! I was really impressed with southern Oregon as a whole, so much to do in Medford as well! What a neat place to visit! Thanks for sharing your trip! I guess the California Gold Rush was the famous one so that’s why we only learnt about it in school, but still, so much history in Oregon that I never knew about! 😮 The trolley tour was so much fun, that is what I call riding around town in style. I loved living in Jacksonville for 8 years. My husband and I bought the Historic Hattie Reames White House on California St. and enjoyed loving and nurturing it. It was always so fun to go to the PO and have people say aren’t you the lady in the big yellow house that decorates for every season. Yes that was me. That sounds amazing Jerri! Jacksonville would be a great place to settle down for awhile, so much history to discover and it seemed like it had the best kind of small town vibe. I am blessed to live in Jacksonville! – place with no Stop Lights, no McDonalds and if my yard is any example, possibly more critters than people. Our little town has a Facebook page and check out the FB of Britt Music Festival. Great music with wine & picnic dinner under the stars on a lovely lawn on your blanket. That’s great K Thompson! Jacksonville seems like it would be a lovely place to live. I hope to make it to a Britt Music Festival in the near future.